TradeNextGlobal is not directed at residents of the United States, but it is more connected with Europe. 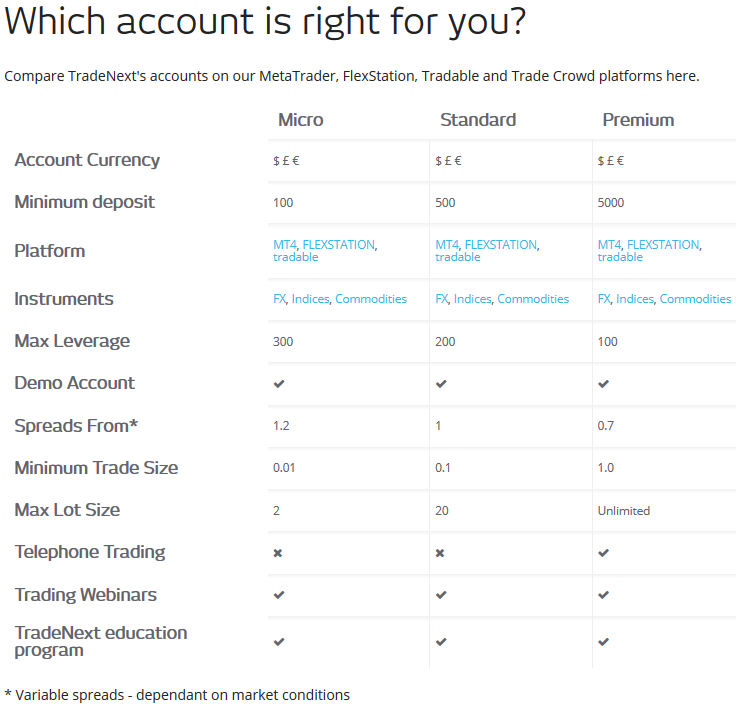 You can use trading platforms such as MT4, FLEXSTATION, tradable and other. You can trade trading tools such as FX, Indices, Commodities and CFDs. You can use maximum leverage of 1:300, as the spreads are variable and starting from 0.7 pip. The minimum trade lot size depends on what account type you will choose and how much money you will invest to your account. They also provide education materials about forex trading, webinars, live news, tutorials and other important things connected with the forex trading. You can also try demo account, as you can see the MT4 lot sizes for all CFDs, you need only refer to their market library. With TradeNextGlobal you can trade long term, short term, intraday, hedge, scalping, with expert advisors, only with one click to your metatrader 4 platform. You can change your language preference, you need only to go to View > Languages and you can choose your default language to metatrader4 platform. You can also trade with your mobile, so this is very comfortable to follow your orders anytime. TradeNextGlobal also have welcome bonus up to 50% on your deposit. You need only to open an account today and you can get up to £100 Trading Bonus instantly and also cashback on your trades! Please read first their bonus terms and conditions.